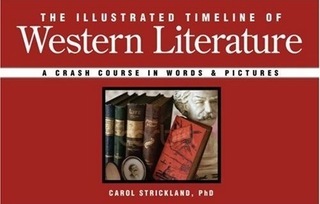 In an innovative format chock full of color illustrations arranged on a timeline, readers can quickly trace major developments and authors in the continuum of great literature. Succinct, color-coded text entries explain the significance of a particular work or the author’s contribution to literature. Sidebars provide more detailed information on specific movements and their link to the social, political, and cultural currents of the times. Introductions to each major period put the era and its great authors in historical context, from antiquity to the post-modern age. Reading this book is like scrolling through the treasure trove of great works of literature, with quotations from individual authors and entertaining facts about their lives and accomplishments. Unabashed “edu-tainment,” the book divides literature into four major periods: (1) from Classical to Chivalric, (2) from Renaissance Seed to Baroque Bloom, (3) from the Enlightenment and Age of Revolution to the Era of Evolution, and (4) From Naturalism to Magic Realism, Modernism to Postmodernism and Beyond. Sample Entry: 1914, "Poems in Robert Frost's North of Boston precisely observe hard, stony soil of New Hampshire and imply truths about dark struggle of life. New England poet milks cows at midnight and writes poems all night. First book hailed by Ezra Pound as 'vurry Amur'k'n.' Rejecting Modernist experiments, Frost sticks to "the old-fashioned way to be new," uses laconic Yankee speech and blank verse in both lyric and narrative verse. Seamus Heaney praises 'his farmer’s accuracy and his wily down-to-earthness.' Nature and chores like mowing, mending a wall, apple-picking are springboard for profound thought: 'I'm always saying something that's just at the edge of something more.' His credo: 'A poem begins in delight and ends in wisdom'."